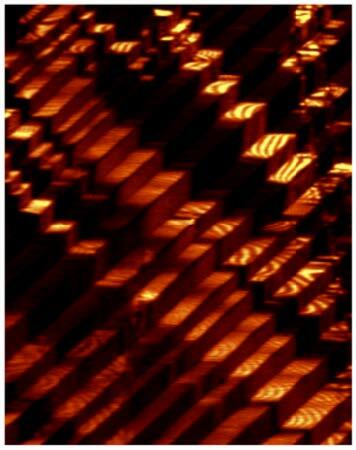 Optical second harmonic generation microscopy reveals a new monoclinic phase (sunshine) with enhanced properties coexisting with classic tetragonal domains (staircases). Piezoelectric materials convert electrical to mechanical energy. They are typically lead-based solid-solutions that exhibit a morphotropic phase boundary, an intermediate compositional region separating two distinct phases, where a new bridging phase with enhanced properties arises. We show that even simple perovskite ferroelectrics such as BaTiO3 and KNbO3 exhibit analogous “thermotropic” phase boundaries in wide temperature regions around thermal phase transitions. In these regions, new low symmetry bridging phases arise, that exhibit up to 400% enhancement in nonlinear optical and piezoelectric properties. These bulk phases are stabilized by long-range internal elastic and electric fields arising from a network of competing ferroelectric domains. The study shows how a small symmetry breaking can lead to large enhancements in physical properties.